Dr. Denis Kozlov was the 2017 David and Ruth Musher/JDC Archives Fellow. His research in the archives focused on the cultural history of migrations from the Soviet Union to the West during the 1970s and 1980s. He is an Associate Professor of Russian History at Dalhousie University in Halifax, Canada and has published a monograph, The Readers of Novyi Mir: Coming to Terms with the Stalinist Past (Harvard University Press, 2013), and a collection of articles, The Thaw: Soviet Society and Culture during the 1950s and 1960s (University of Toronto Press, 2013, paperback 2014). Q: Can you tell us how you came to this research project on Soviet Jewish transmigrants? A: In part, my interest in the topic is personal. 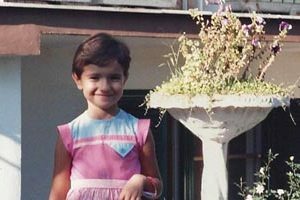 I come from a Russian Jewish family, and even though my own migration to North America took place later than the events I research, I vividly remember how our friends and relatives were leaving the Soviet Union in the 1970s and 1980s. After becoming a historian, I gradually developed an interest in studying this large-scale migration at a level of professional historical research. As well, transnational migration is a major phenomenon in the modern world, and its importance is likely to grow as we move further into the twenty-first century. I hope that my research on Soviet Jewish migrations to the West may shed some light on the more recent processes that we witness today. Q: Your public lecture at the JDC Archives focused on the transmigrants’ experience in Italy, where they were in transit as they waited for the processing of their applications by the US Immigration and Naturalization Services. What is it about that period that drew you in? A: The Italian passage was important for everyone involved: for the migrants, for the voluntary agencies and government institutions that facilitated their relocation, and for numerous local Italians. Although the ex-Soviets initially arrived in the West via Austria, their stay in Vienna was a brief one compared to the more extended Italian sojourn that ranged from several weeks to several months. Rome and its metropolitan area thus became the principal gateway to the West for thousands of people fresh out of the Soviet Union. Many complications and controversies accompanied this Italian layover. What interests me in particular is how, during that first meaningful encounter with the West, the values that the ex-Soviets brought with them came into direct, at times turbulent, contact with the values of the Western world that received them. 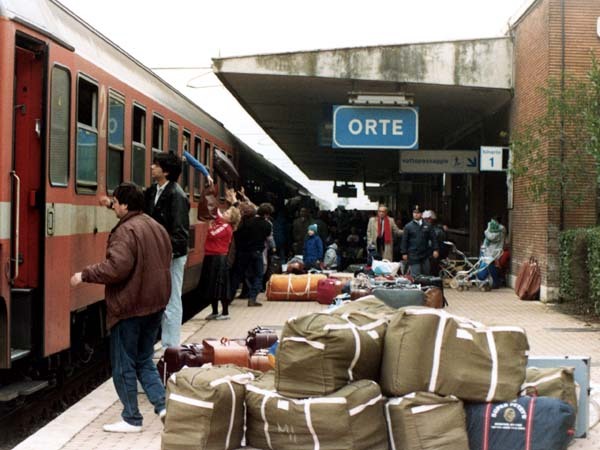 Q: What difficulties were encountered by the ex-Soviet transmigrants while they were in Italy? A: To begin with, this entire migration was difficult, as is anyone’s permanent move to a different country. 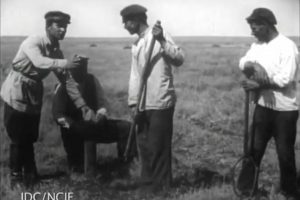 Abandoning their homes in the Soviet Union, leaving friends and relatives behind, relocating to an entirely new, unknown society with unfamiliar customs, manners, life habits, and standards of work – all this was immensely difficult for the migrants. It did not help, either, that the overwhelming majority of them had poor command of English, let alone other Western languages. Among those was Italian, which practically none of the ex-Soviets knew (such cases happened but were exceedingly rare). Thus, people had to spend several weeks or even months in a country whose language they did not speak. On top of those predictable hardships, the Italian passage presented a few other obstacles. The duration of visa processing at Western consulates in Rome varied, and while consular officers tried to work as fast as possible, delays inevitably happened. The length of visa processing varied from consulate to consulate. Americans were usually the fastest, Canadians somewhat slower, and Australians the slowest. Bureaucratic backlogs tended to be especially serious at moments when the influx of migrants from the Soviet Union exceeded the processing capacities of Western consulates. Additionally, receiving an immigrant visa was by no means guaranteed. While most migrants did get visas eventually, applying for those could take several nerve-racking attempts. This was especially true during the late 1980s, but even prior to that success was not assured, either. Particularly difficult was the situation of those who decided to change their country of ultimate destination and residence while en route or shortly after the first relocation. In those cases, the wait was especially long, the procedure uncertain, and people were kept in suspense for extended periods of time. Last but not least, the financial allowances paid to the ex-Soviets in Italy were small. This forced many of the migrants to count every penny, to adopt a meager diet, and to live in overcrowded dwellings that sometimes lacked basic amenities. To supplement their incomes, the ex-Soviets frequently sold their belongings at local bazaars and/or sought temporary employment as sales assistants, mechanics, waiters, and the like. Such employment, of course, was completely illegal: the migrants did not have the right to work or engage in business activities while in Italy. Relations with local Italians were usually quite amicable, and yet occasional tensions did arise, too. Overall, the range of difficulties encountered by the Soviet migrants in Italy was broad and diverse. What I describe here is a very long story rendered very short. 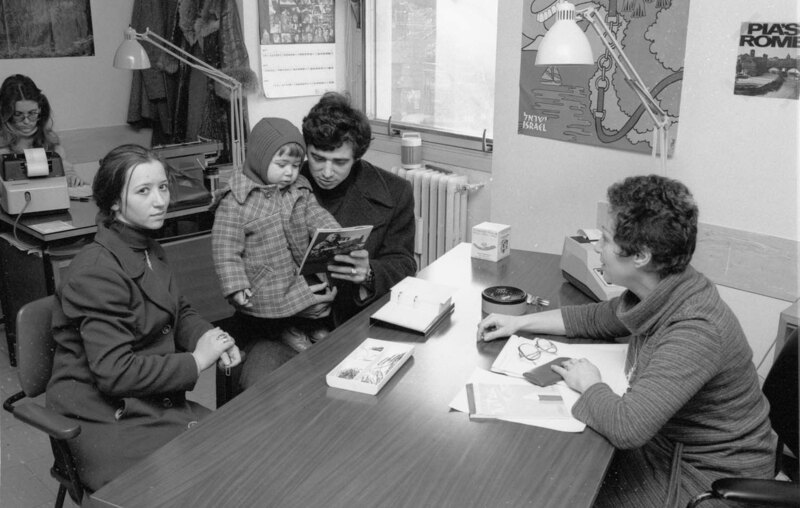 JDC staff member Pia Adad (right) with Soviet Jewish clients in JDC Rome office in 1980. Q: What did your research at the JDC Archives reveal about the role and activities of JDC with transmigrants? A: The JDC played a crucial role in facilitating this migration. The movement of thousands of people from the Soviet Union to the West was a complex multinational operation that involved the U.S. and Italian governments, numerous Israeli institutions, a range of voluntary agencies, as well as a network of Jewish federations and services in the U.S., Canada, Australia, and Western Europe. A division of labor existed between the JDC and other organizations that took part in the process. It was the JDC that took care of the migrants’ everyday maintenance as they stayed in Italy awaiting entry visas to Western countries. The JDC paid the migrants’ living allowances, provided initial housing, free medical care, as well as organized a number of cultural and educational activities. 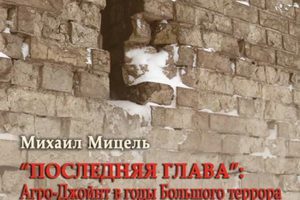 Via a network of clubs in Rome and its vicinity, the JDC organized programs that sought to inform the ex-Soviets about Jewish culture and traditions as well as offered other advice about the countries to which they were headed. Q: Did you find anything during your research in the JDC Archives that surprised you? A: Perhaps “impressed” would be a better word. I was impressed by the range of multi-decade and multi-national experiences that many JDC workers brought to what they were doing. While reading these archival materials, I encountered individuals who had spent decades helping refugees from various countries and origins. In the past, some of these people had been refugees themselves. Their work dated back to World War II and the Holocaust as well as the immediate postwar years. The extent to which the Soviet migration of the 1970s and 1980s was part of this broader history of twentieth-century transnational migrations, was remarkable. Q: A related question: did you find anything in the JDC Archives that that might lead to a new project? A: The evidence I have found is very rich, and many possibilities exist for future research projects. One, for example, is a study of resettlement and acculturation of Soviet immigrants in Western countries of their final destination. After the physical passage of migration itself, this was the next crucial stage in their experience. I have a lot of evidence on this topic and do plan to write about it. Q: Do you have any tips for scholars just beginning their research in the JDC archives? A: I would highly recommend beginning scholars to work closely with the excellent archivists the JDC is fortunate to have. My experience of working with JDC Archives staff was most rewarding. They are very knowledgeable, helpful, and will make every effort to maximize the results of a scholar’s research in the JDC Archives.